In stock and on demo! 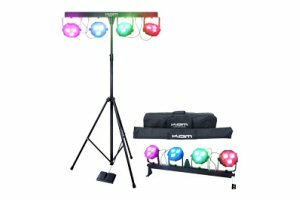 The Kam LED Power Partybar is a compact yet powerful all-in-one LED lighting system. It features 12 tri 9w super bright LED’s with a 25° beam angle and full individual positioning for complete control over your lighting. A 10kg compact, dynamic ready to go design makes the Power Party bar perfect for stage performance, parties and travel. Set up the rig in minutes and your ready to go! Integrate the Partybar into your rig with it’s DMX input and output. The package comes complete with a lighting stand, foot controller, a padded case and a lighting stand bag for full kit protection. Come and try the LED Power Partybar at Nevada Music.